Let's be honest, if you are in the Command and Control industry, you pride yourself in organization, optimization, effectiveness and efficiencies. Like the grease to the wheel, you like organization and to keep things working at their best. The placement of command center workstations in a control room should be just as important for the optimal performance of your operators. Having miss-used space or disorganization can cause the efficiency and effectiveness of the team to dwindle. How do your people need to communicate? Do they need constant communication or do they need a focused, quiet space? This can make a big difference in the layout of the room. What is the workflow? Does one position need to work together with another person? What is the proximity needed based on the roles in the room? What is the flow of the room? Should pathways be inside the workstations or outside the workstations? What doors are most used? Does the flow of traffic change during certain times? Does the area need to be ADA compliant? What other resources are important? Do map tables need to be close to certain operators? Are binders important daily or infrequently? What other equipment is needed in the room; additional radios, phone system etc.? What else is essential for your team? Training desks, personal lockers, treadmill at one of the consoles, freezer for ice cream, popcorn makers (one client has two in the room; one for regular popcorn, the other for kettle corn), snack racks, a fish tank – these are needed in distribution centers, transmission centers and traffic control centers around the country. Notice that food is a priority! Keeping your people hydrated, fed and focused is key for great performance. Space planning a room with special considerations of your people’s health and comfort should be a priority. Without the organization of your space you'll find less job satisfaction and efficiency among operators. 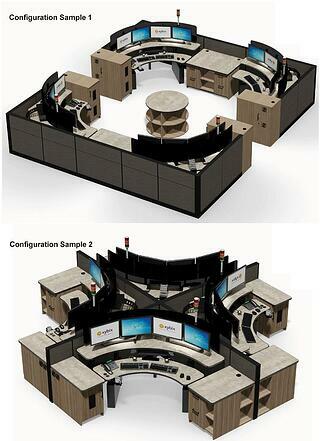 What does your Command Center room need to support your people so they can do their job even better? Take a fresh look at the room, what needs to change?